Want to be notified of new releases in FriendsOfREDAXO/redaxo-mit-bimmelbam? A generic frontend workflow that does not necessarily require REDAXO but works in several contexts (static website, different CMS, web app). 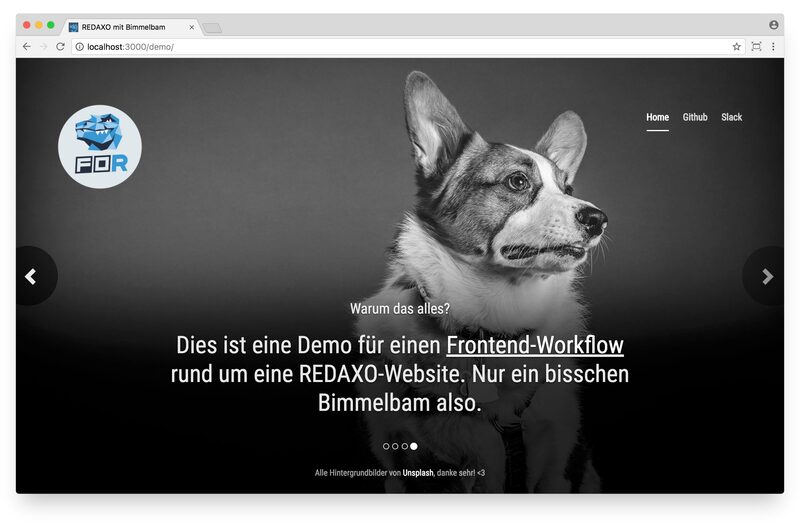 REDAXO and a static front-end prototype share all assets (CSS, JS, media, ...). The prototype is used for the complete frontend development. Implementation for REDAXO can be done separately (useful when working in a team). Switch between develop and production mode without touching REDAXO, there is no need to modifiy templates or modules. Linting, so that code meets the requirements. Testing, because people are constantly making mistakes. Continuous integration (CI) to not always having to assemble the project by hand. Install Yarn if not already available (Manual). Change to our directory in the terminal and fetch the required packages. Attention, several hundred megabytes of data are coming through the line! Set up a localhost/vhost (for example, http://local.bimmelbam) for our project that is able to run REDAXO. Target directory of the host is /app! Create an .env file (Environment) inside of the project root. Just copy the .env.example included in the package and adjust it accordingly: APP_HOST corresponds to the host you have previously set up, APP_ENV can remain at development for the time being. No worries! Join the REDAXO Slack for help or leave a post on the Forum, we’ll try to support you! This project does not contain a REDAXO installation. Once your gulp tasks have completed successfully, you can now manually add REDAXO into the /app directory. It already contains the common REDAXO folders. Once your REDAXO is up and running, you can implement the website with templates and modules as usual. 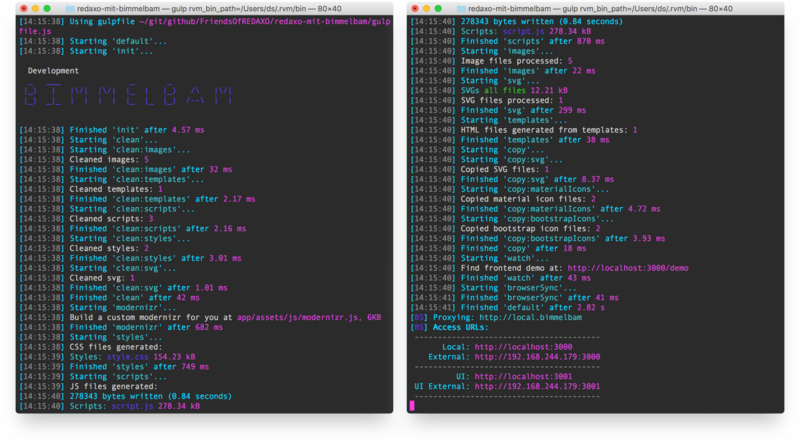 Take the HTML from the prototype (adapt file paths as required) and include the same assets. When done, you’ll see a working REDAXO website whose output is identical to the prototype. If you prefer to develop your frontend within REDAXO from now on, you can discard the prototype. However, the intention of this project is to convince you to develop frontend outside of REDAXO using the prototype. Why? Because it’s more efficient and comfortable, and also because it can be done by fellow workers who concentrate exclusively on frontend development and don’t require REDAXO and PHP experience. The front-end workflow is complete, so we can now optimize the development environment for the backend. For example with Docker, to enable a consistent setup for the team and to be independent of the local system environment of the computer. 👉 If you do not want to run Bimmelbam with Docker, you can simply delete these components if it gets too confusing for you. We use Docker for Bimmelbam to provide a server environment (Apache, PHP, MySQL). That’s pretty handy, because then your computer does not have to be set up for that, and besides, if you work in a team, you all end up with the same server environment, regardless of the operating system you’re using. 👉 We use port 20080 for HTTP and 23306 for the database, so as not to conflict with the standard ports 80/3306, if they are already in use. That makes our setup more robust. If you use several Docker projects, you have to keep in mind that all these ports use and therefore only one can run at a time, not several at the same time. 👉 We still use the port 3000 to call in the browser, as defined in Bimmelbam (see config.js). Bimmelbam uses a proxy pointing to port 20080, where Docker provides Apache. Do not let that confuse you. It does not automatically install a fresh REDAXO. It also does not install demo sites. It doesn’t include Mailhog to send mails from REDAXO. The volume for the webroot is the folder app/ while in the parent package it’s html/. If you prefer to work with the large Docker setup here in Bimmelbam, you can easily copy the required files and folders from »REDAXO with Docker«. After that, you only need to change the webroot to app/ in docker-compose.yml. Everything else can be retained and should work seamlessly in Bimmelbam as well.